Esther Miller, who lives near Okmulgee, is being recognized as a Significant Woman in Oklahoma Agriculture. One ride plus one full day equaled two lessons learned for Esther Miller. Although Miller grew up on a farm, she learned some valid points of ranch life from husband Dave Miller, rather quickly. It was an August morning in humid eastern Oklahoma. That’s not all. Miller, who lives near Okmulgee, has a tip from another experience that might help a new ranch bride out somewhere down the road. Esther was born in the 1930s to Aldon and Rose Sullivan Magness, who raised wheat, cotton and cattle near Geary. In later years, the family took on a custom wheat harvesting business and operated combines from Grandfield in southern Oklahoma all the way to Montana. Through those years, Miller saw her parents work hard and steady for what they had and she realized nothing is for free. Esther and Dave met in 1952 while students at then-Oklahoma A&M College. They married in 1953 and Dave was drafted soon after that. 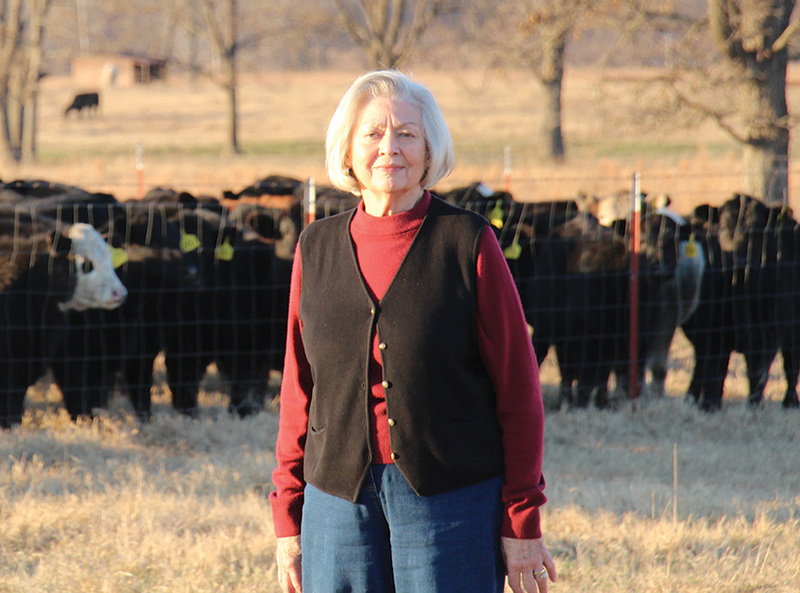 Dave came from a pioneer ranching family, a cow/calf operation in northeastern Okmulgee County. In 1878, Dave’s grandfather Bluford Miller and his new bride, Lizzie Anderson, made their home in a log cabin along Rock Creek. Two years later they moved into an L-shaped two story house. Today, Esther and Dave live in that house that was remodeled nearly a hundred years ago, in 1919. Dave and Esther lived on the family ranch at Mannford in Creek County and then moved to the ranch in Okmulgee County after his father Bluford W. “Bunch” Miller died in 1963. The business is still very much a family endeavor. Esther and Dave have three sons: David Jr., John and Mark. Between the three sons, Esther and Dave have six grandchildren and one great granddaughter. When the interest rates were so high in the 1970s and 1980s, Esther Miller said they were just starting in the stocker business and it was pretty tough getting the lenders to loan money for stockers. However, they kept their heads up and continued trying different things and finally got through it. “When things came together for us financially, I realized even though there had been a lot of trials, we had really had a wonderful life through it all and feel that we have been truly blessed,” she said. Miller feels that is a lesson learned that equals a lifetime worth of blessings. “It seems to me if we all took that to heart it would be a better and happier world,” she said.